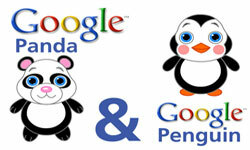 Worried about the Panda and Penguin algorithm updates de-ranking your site and causing it to fade into the digital haze? It’s understandable; you’re not the only one who is and lots of sites have already suffered the ranking consequences of applying bad on-page SEO to their sites despite the changing face of search rank metrics. However, don’t get too worried just yet; fixing your page so that Google Penguin and Panda aren’t a major worry isn’t really that hard or complex if you have a list of the key steps you need to take at hand. Apply the following starting today and keep applying them from now on to make sure that your SEO at least doesn’t suffer thanks to a bad profile in the eyes of Google. Both Panda and Penguin hate badly written, low quality content that doesn’t actually deliver the goods and instead simply exists to please a search bot with the minimum SEO requirements that used to be the case. This includes content that’s spammy, pure advertising, really thinly written and content that’s stuffed with keywords to the point of being unnatural and hard to read. Forget all that and write your content to please your human fans! Make it informative, densely packed with information and as unique as possible. Also, aside from being sure to include your main keyword a time or two through natural writing, forget keyword percentages and using the same phrase on every second line. Your internal link structure needs to exist and it needs to be interconnected in such a way that lets a user (or search bot) navigate your pages in a flowing hierarchical order or at least easily access everything important without hunting for it. This means that you should make absolutely sure to include easily navigable in-content links and menu links in such a way that every page of content is easy to find from almost every other page within no more than a couple of clicks. Additionally, create a text based link structure, No Flash or Java since the Google bots will completely miss it and fail to index your valuable content pages. So, we just mentioned properly linking your site pages but now we need to explain that it’s also important that you also link them the right, post update friendly way. What this means more than anything is that you need to avoid over-optimizing your anchor text the text that’s used to form your actual on-page links. Instead of repetitively using the same keyword or phrase for every on-page link, diversify and make your selection of anchor words naturally fit with the flow of your content. Penguin in particular will appreciate you for this. A bounce rate is the percentage of visitors that arrives at your site and immediately leaves because they don’t like what they found for some reason. This could be caused by all sorts of things including but not limited to: annoying flash introductions, auto-playing videos, music that auto-plays and can’t be shut off easily or a lack of the content the viewer was looking for. Another cause of high bounce rates is poor usability that makes navigating or loading your page difficult and slow. Whatever the cause, if your website analytics is showing you a high page bounce rate, start tweaking things until you’ve gotten it to lower down as much as possible, preferably below 50 to 40%. Are your site pages well integrated with social media, especially the important platforms like Twitter and Facebook? If they aren’t then they should be. While Google doesnt directly measure social integration as part of its Penguin or Panda criteria, they do play an important part in good page optimization since both updates are very keen on organic page sharing as part of their ranking metrics. Thus, the more socially integrated your valuable, useful content is, the more likely it is to be shared by people across their social media accounts or even on their websites. This will raise your SEO profile down the road. Just as Google doesn’t want your site to be a low quality URL that’s full of thin, spammy content, it also doesn’t want to see you linking to other sites that have those exact qualities. Thus, look through your on-page content and if you see that you’ve been heavily linking to content farms or websites that promote spam and other dirty tactics, you should really think about getting rid of them. Failing to do so may not directly influence your rankings but it’s probably better to be safe than sorry, especially in light of Penguins scrutiny of bad link structures. George Zlatin is a co-owner of DigitalThirdCoast.com, a digital marketing firm from Chicago. When he’s not helping people improve their online presence he loves spending time with his 2 kids, teaching them about everything the world has to offer. Yeah you have a point when you’ve said that Google Panda and Penguin hates low quality content, sites that has large amount of advertising, over-optimizing and slow navigable content link. Also, your right about implementing your written strategy in order to avoid being hit by these Google Panda and Penguin update. It is because when the presenter of Panda Breakthrough instructed me to do navigation modification, modifying how I wrote my content, adding more elements for the visitors and changing my layout, my site was able to recover from the Panda update. Until now my ranking and traffic is great. I also noticed that it was no longer affected by the numerous update introduced by Google. Indeed, there were rumors that there was a Google update last Dec.11-13,2012. Other site owners were again affected by it but for my site there where no changing at all. I think you missed out duplicate content issue. Web content must be unique now even you can’t spin other site content. Some people don’t make unique about us, privacy pages. These pages also need to be unique.